Below the line of Peter Beaumont’s ‘Comment is Free’ piece on May 29th, The Houla massacre shows how killing can become normal, there was this off-topic comment, on Israeli Jews’ sad moral and political pathos, by a reader using the moniker herodot, which hasn’t been deleted by CiF moderators. There’s so much here in so little text. Here’s a breakdown. Jewish genetic superiority: Jews, fortunate enough to carry the intelligence gene, were fortunate enough to possess the highest IQ in the world. Jewish descent into brutality and violence: Alas, Jews wasted their precious intellectual gifts by succumbing to the vice of violence, and becoming a permanent tribe of warriors, Goliath chasing the Palestinian David – Arab “adolescents” whose sole crime is to rebelliously throw stones. Condescension: In fairness, however, there are still a few good Jews left, “God bless their souls”, who rebel against the prevailing Semitic aggression and still enchant the world by delighting in more cerebral pursuits. A trenchant and probing analysis of Jews’ fall from moral and intellectual grace, all in a remarkably thrifty 159 words! 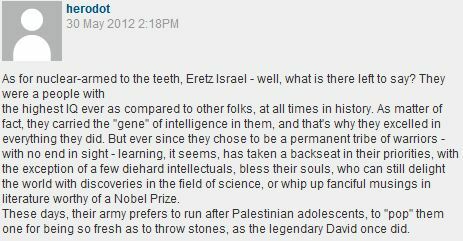 The comment is clearly written by an anti Semite couching his words to hide his anti Semitism. Not that unusual for Guardian commenters. Berchmans and his longevity springs to mind. To be honest, there’s not much couching going on here. This is straight-up rabid anti-semitism. …and the comment has now been removed. Means philo-semite he is not. Lets spank his anti-semite botty. Herodot munches pretzels as he writes, I imagine. The guy’s a wacko. Does he really deserve an article? It’s also silly to headline them as a “Guardian reader”. I always prefer ‘Guardian reeder’. It so captures the quality of a person willing to subscribe to The Guardian.